Please help keep this evangelization work alive. So far a few have donated, but I have not met the goal. In December, I have to pay for the renewal of this domain name, so I need your help. I also want to expand this work so it can reach even more people. Please help me meet my campaign goal by donating at: www.gofundme.com/sacerdotus. If about 2,700 people donate only $9.25, then I will meet the goal. As more people donate, gofundme will in turn place my campaign on the front page of their website giving it more promotion. So I hope you reading this will help with a donation. Thank you, God bless + Mary keep! Today's readings continue on the Holy Eucharist. The first reading tells us that God's wisdom invites us to a feast. This meal is a big one with meat, wine, a large table etc. Sounds like a Catholic Church with the altar and the Body (bread) and Blood (wine) of Christ (Eucharist) right? Keep that thought. The feast is in a big house with seven columns. Seven in the Bible is God's number symbolizing perfection, divinity and so forth. In the Bible, you will always notice that the number seven is used when referencing God or something related to Him (Revelation 1:4, Genesis 2:2). Anyhow, the maidens are sent out inviting all to come to the feast (Matthew 22:3). God's calls the simple and those who lack understanding (Proverbs 3:34, Psalm 138:6). They are invited to come and eat of the food and drink of the wine (Ecclesiastes 9:7, Psalm 104:14-15). This meal is the Holy Eucharist (Luke 22:19-20). The holy Mass is the feast the wisdom of God invites us to (Isaiah 25:6-9, Revelation 19:9). We come to this feast lacking understanding, but the meal will bring us an advancement of understanding as we grow in grace and faith (1 Corinthians 13:12). We must taste and see the goodness of God as we read again in today's responsorial Psalm. We repeat last week's responsorial Psalm with the exception of two verses. We are called to "taste and see the goodness of the Lord." In order to do this, we must be with God, bless Him, praise Him, let His glory shine in our being. We must be happy and proud to be with God and not "blush with shame" (Mark 8:38, 2 Timothy 1:8). God hears us during our distress just like He heard Elijah (1 John 5:15). God sends His angel to protect us and aid us just like with Elijah (Psalm 91:11). However, just because God protects us does not mean we have license to act and think foolishly as the second reading tells us. In the second reading, we are told to be careful with how we live our lives. We must not be "foolish persons" but live like wise people. As Catholics, we must make the most of every opportunity to live in holiness because the "days are evil" (Romans 5:20) How true are these words today!? Our nation has legalized a perverted form and mockery of marriage. We are learning more and more about a federally funded organization that sells fetal parts. Stores are removing gender from their toy aisles and a confusion of what it means to be a male and female is spreading. The list goes on and on, but you get the point in regards to the "days of evil" that we are living in today. We must not continue in ignorance (1 Peter 1:14). Instead, we must seek God's will in our lives (Psalm 27:8, Matthew 6:33, Jeremiah 29:11). God has a plan for each one of us (Psalms 37:23). That plan is not meant to hold us back from our potential, but to help us realize it while at the same time living up to the standards of being children of God (Philippians 2:1, Jeremiah 29:11). Moreover, we must not acquire vices with wine and drinking in general but focus on being filled with God's spirit (Leviticus 10:9; Numbers 6:3; Deuteronomy 29:6; Judges 13:4, 7, 14; Proverbs 20:1; 31:4; Isaiah 5:11, 22; 24:9; 28:7; 29:9; 56:12). As Catholics, we must be a people who are happy, joyous and peaceful, singing to the Lord and helping one another (John 13:35). Finally, in the Gospel, Jesus tells the crowd something that causes them to freak out. He tells them that He is the living bread that came down from heaven and that whoever eats of this bread would live forever. This does not sound too bad, but what Jesus says next really freaks the people out. He says, "the bread that I will give is my flesh for the life of the world." This caused the Jews to murmur among themselves asking, "How can this man give us His flesh to eat?" Jesus does not excuse Himself but responds with, "Amen, amen, I say to you, unless you eat the flesh of the Son of Man and drink His blood, you do not have life within you. Whoever eats my flesh and drinks my blood has eternal life, and I will raise him on the last day. For my flesh is true food, and my blood is true drink. 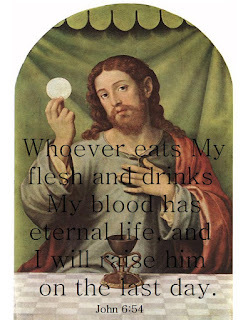 Whoever eats my flesh and drinks my blood remains in me and I in him." Jesus is literally telling the people to eat His flesh and drink His blood. What would you if someone comes up to you saying this? You would probably think this person was on drugs or delusional. The people at the time thought no differently. They thought Christ was crazy. We can see via the text that Jesus while saying something crazy or out of the ordinary, was very serious. The idea of Himself being drink and food was literal, not a metaphor. Jesus in the Holy Eucharist is truly present. 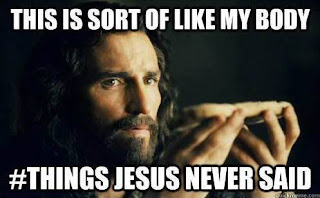 Moreover, as a former atheist I can state with sincerity that the idea of the Holy Eucharist is "crazy." I say this with all respect, of course. Let me explain why: God is known to do things foolishly, illogically and completely contrary to how we think things should be done and this foolishness of God in reality is wiser than anything man can formulate (1 Corinthians 1:25). The Holy Eucharist is one of these "foolish" ideas which really is wise and shows God's genius. The answer is no as we have read these past Sundays. In John 6:22-69 Jesus gave a long talk about the "Bread of Life." He goes on to say that the bread Moses gave was not the "True Bread." The people asked Him for this "Bread of Life" and He then makes the radical statement that HE is the "Bread of Life" and the "True Bread from Heaven." The people began to murmur among themselves because they knew Jesus was the son of Joseph, and not to mention that His words were a bit strange and in today's world would be seen as psychotic. However, it gets "stranger..." Jesus continues saying that one has to eat His flesh and drink His blood in order to have eternal life. This is when the people really had enough. Many walked out on Him thinking He was a lunatic. Jesus then turns to His disciples and asks them if they will leave as well. Peter replies saying that they can't go anywhere else because Jesus had the words of eternal life. Moreover, something interesting happens here in regards to how serious Jesus was about eating His flesh and drinking His blood. Many of our separated brethren believe the Holy Eucharist is a symbol and not literally Christ's Body Blood Soul and Divinity. However, when people started abandoning Jesus for saying that one has to eat His flesh and drink His blood, Jesus did not run in front of them and say "hey, wait a minute, I was joking." Instead, Jesus let them go. This shows that He was very serious about His flesh and blood being actual things that someone has to consume. In 1 Cor 10:16 St. Paul reminds the people that the bread and wine are the Lord's Body and Blood. In Genesis 14:18 we read about Melchizedek - priest of God and king of Salem- giving Abram bread and wine. He then blesses Abram. Jesus uses bread and wine to make the connection to the Old covenant and to show that He is the True Priest who offers the True Sacrifice - Himself. Bread is a food that is delicious that can be served with literally every food on Earth. It has a lot of carbohydrates which in turn gives a lot of energy to the body. It is a food that is easy to make, but does a lot to appease hunger and give nutrients. Then there is wine. It is used to party with. It was even used as medicine and a disinfectant agent for wounds. Jesus as Bread and Wine does exactly that to our souls. He appeases the hunger for God and nourishes the soul. He brings our souls to jubilation by uniting with it when one receives Holy Communion. He heals the soul from the harm sin has caused. One may ask: at Mass the Bread and Wine still look, taste, smell, feel like Bread and Wine, so how can it be the Body and Blood of Christ? Well, God knows us well. God designed the human body and mind. He knows that human beings would cringe at the sight of eating raw meat and drinking blood. How many times have we ourselves have gotten disgusted at looking at our own wounds? It is not easy seeing blood and flesh in a traumatic form. A few years ago, there was a big buzz in social media regarding the "Zombie" in Miami. A man who was high on "salt" - a drug - attacked a homeless man and literally ate his face. People were disgusted at the news and the reality of how a human can even succumb to this evil cannibalistic act. That being said, God would not give us human flesh and blood to eat and drink in the material sense. Rather, He would use matter that we are all familiar with and that we enjoy: food and drink. At consecration, the Bread and Wine do not turn into a piece of meat and human blood with DNA, platlets, red/white cells etc - unless a Eucharistic Miracle has taken place which some times does occur. The outside, or the accidents of the bread and wine remain the same, but what it is, or the essence changes. Think of it this way: We see leaves on trees. During spring and summer they are green. However, during fall they begin to change colors. They turn red, orange, yellow and brown. Now let's think: which one is the REAL leaf? At one point it was green, then red, then orange, then yellow and then brown. The leaf changed colors, so is it the same leaf when it was green? The answer is yes. The outside or accidents of the leaf changed, but the essence or what it is remains the same. The same with the Bread and Wine at Mass but in an opposite manner. The outside remains the same (bread/wine) but the inside or what it is changes and becomes the Body Blood Soul and Divinity of Our Lord Jesus Christ. Similarly, we ourselves go through many changes. Our bodies grow and change as we age; however, our temperament remains the same. So we can see how "God's foolishness" and "craziness" is wisdom for us. God uses bread and wine because He understands us. He understands that no one is going to literally eat human flesh and blood. As God, He can transform bread and wine into the literal body, blood, soul and divinity without making it into a disgusting cannibalistic rite. This is because with God nothing is impossible (Luke 1:37). Moreover, Neil Degrasse Tyson is the one who is crazy for thinking that tachyon particles or hypothetical particles believed to travel faster than the speed of light (186,282 miles per second) exist and can cause Cherenkov radiation, which is another hypothetical scenario where light creates a "sonic boom" effect if something forces it to go faster than it normally does, breaking its barrier. Our Lord gave us Himself in the blessed Sacrament and we should make every effort to visit Him and communicate (receive Communion) with Him while in the state of grace; and yes Tyson, the Holy Eucharist is "crazy" but this craziness reflects the wisdom of God which trumps the nonsense we human beings posit via materialistic philosophies and scientific ideas based on overactive imaginations. May Jesus Christ present in the Holy Eucharist be praised! Josh Duggar Cheated on "Ashley Madison"
Donald Trump - Does He Have a Chance?